Only large retailers have felt the benefits of Russia’s first year of membership in the World Trade Organization. Experts at Moody’s summed up the results of the first year of Russia’s membership in the WTO. Exporters’ hopes have not been justified yet, as about 100 restrictions are still imposed on Russian companies. The agricultural sector and light industries are among those affected. However, there is potential for a growth in exports from the Russian Federation, as well as for the protection of the domestic market. Moody's experts believe that it will take at least 3–5 years to ensure that facilitating easier access of Russian companies to foreign markets and harmonization of legislation have a positive impact on the credit image of Russian businesses. So far, 68 percent of the surveyed respondents have not noticed any changes (17 percent gave a negative appraisal, and 15 percent gave a positive one). Large retailers, importers and distributors for international chains in the consumer sector primarily have benefited from the country’s WTO membership. The ratings of these companies for this year have improved significantly, says the agency’s report. At the same time, according to Moody's, Russian goods are hindered from entering new markets by the unfavorable external economic situation. Russia became a member of the WTO (the 157th country) on Aug. 22, 2012, after 18 years of multilateral negotiations. Among the major promises made by the Russian side was the gradual decrease in the average import tariff from 10 percent to 7.8 percent. In regards to this, experts predicted big problems for industries operating in the domestic market. These fears partly came true. Moody's noted difficulties in the light industry, but the major sector that felt the previous “lack of price competition and dependence on government support” was agriculture, according to experts at Global Counsel. Thus, import figures for individual foods (mainly dairy products) grew by 5.8 percent, while clothing and footwear imports grew by 12.8 percent. However, there is considerable potential to support this industry. Compensations to the agricultural sector had been agreed upon during earlier WTO negotiations — a maximum of $9 billion per year, with a gradual decline to $4.5 billion by 2017. So far, however, these figures have not been applied. In addition, the state has other ways to protect the market: For example, this year, a ban has been introduced on the import of live pigs from the U.S., Brazil and the EU, due to claims of antibiotics use in these countries. The automotive sector, where imports have been decreasing since last September, was significantly less affected than expected. However, this situation may change. In July, the European Commission formally challenged Russia’s introduction of a utilization (disposal) fee on imported cars. If the parties cannot reach a compromise, the WTO is likely to recognize the fee as discriminatory. The expansion of this utilization fee onto domestic manufacturers could cost just one auto concern, KamAZ, $300–540 million per year, according to Moody's experts. Besides this, the opening up of the domestic market continues: Starting this September, import tariffs on 5,100 products will be reduced by another 1–3 percent. Experts note that the interests of Russian businesses are not sufficiently protected: They are promoting the rapid accession of Kazakhstan and Belarus into the WTO, as well as dealing with a shortage of qualified personnel able to understand dispute procedures. “It is obvious that companies and government officials are not fully prepared for all the consequences of the Russian Federation’s membership in the WTO,” says a statement made by the Global Counsel. 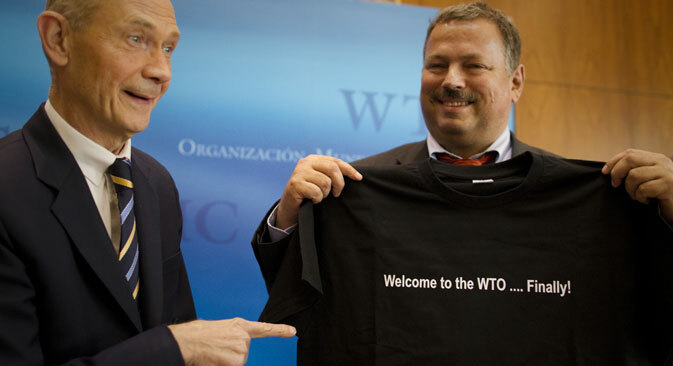 In particular, Russia has no permanent representation at WTO headquarters. “All in all, more than 100 restrictive measures are still imposed on Russian goods; these are mainly anti-dumping measures against the products of the metallurgical and chemical industries,” said Vladimir Chikin, a customs practices partner at Goltsblat BLP. The EU has restrictions on wheat imports; China, Mexico and India restrict the import of pipes and steel; meanwhile, the U.S. and Australia have restrictions on the import of fertilizers. Most of these restrictions, according to Moody's, are imposed on the companies Severstal, NLMK and Fosagro. Three experts say Russia has already reaped many benefits from joining the WTO during its record 18-year accession. All three see it as an important step toward modernizing the economy, but don't expect surprises in the future.